So the last two posts have been about folate versus folic acid. (First post and second post.) Lots of science to explain why the folate from real foods is better than folic acid from enriched, processed foods and vitamins. But let’s put it into action! How can we get folate into ourselves and our families? Smoothies. Everybody likes a smoothie. Right? Smoothies are deceptive foods. A banana. A spoonful of nutbutter. Some yogurt. A little chocolate. A splash of sweetener. Taste. Needs more banana. Oops. A little bit more of nutbutter. Add some ice. Taste. Dang. Overshot. Needs a little more sweet. Have the kids taste. Needs more chocolate. How about some vanilla? Perfect. Kids drink half theirs. I drink all mine and all their leftovers. So much for a “healthy” snack. Guarantee I’ll have a carbohydrate crash nap after about an hour. Zonk. Place into blender and blend until smooth. I put the greens in last so the mixture blends evenly. This recipe made the above two glasses full you see in the photo. 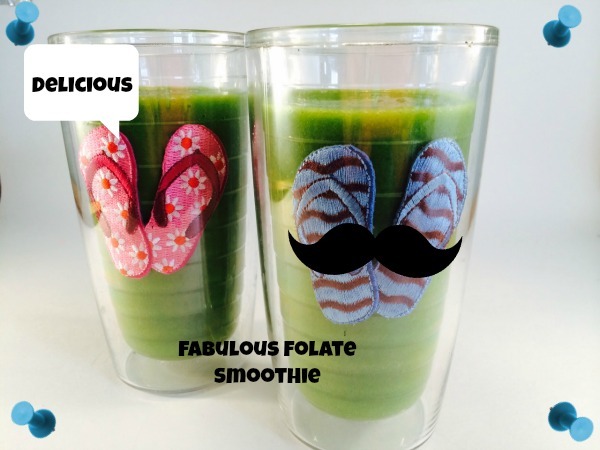 The folate content of this green smoothie is about 160 micrograms. Recommended folate intakes are as follows in the table taken from the National Institute of Health Folate Fact Sheet. DFE refers to dietary folate equivalents. The carb count for those interested is about 71. If I’m the only one drinking this, I will often use only half a banana and Stevia instead of maple syrup. Eat real folate! It’s good for you! Try to get your nutrients from food if you can. Make every bite count! Do you drink green smoothies? Do your kids? Does your spouse? I’m converting mine over finally! Two years. Two years into this. It’s not a fast-paced game to convert your family to this way of eating! But it is worth it! This entry was posted in Nutritional Intervention and tagged GAPS, getting kids to eat more greens, green smoothie, green smoothie for kids, how to get folate, paleo, primal, real food, SCD, whole foods on August 5, 2014 by thehomeschoolingdoctor.